The rising Red star: Kanhaiya Kumar. The big brotherly attitude of the RJD and the Congress is not going down well with the Left parties including the CPI, the CPI(M) and the CPI(ML), keen though they are to be a part of the Grand Alliance in Bihar for the upcoming elections. Between them the three Left parties are eyeing at least 10 of the 40 LokSabha seats in the state, but have little chance of getting these. While the party has announced fielding candidates in at least six seats including Arah, Siwan, Karakat, Jehanabad, Patliputra and Valmikinagar, CPI(ML) general secretary Dipankar Bhattacharya has warned the RJD and the Congress that the Left and the Socialist parties would go to the polls together if they’re not given a respectable seat share. “We, the Left parties are united and have a formidable support base,” he said. 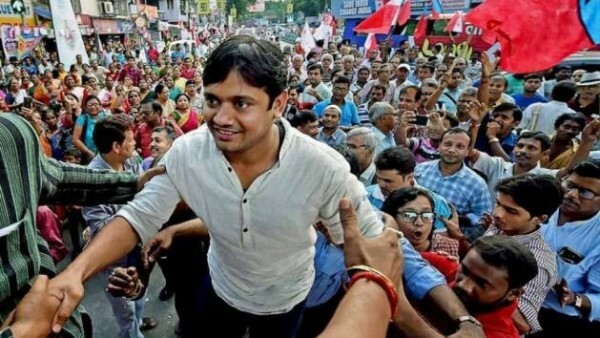 Former JNU students’ union president Kanhaiya Kumar is likely to be a CPI candidate from Begusarai. “Kanhaiya Kumar has been visiting villages and semi-urban pockets in Begusarai since last December to meet people and seek their support,” a CPI leader said. CPI state secretary Satyanarayan Singh said talks for seat sharing were on with leaders of the Grand Alliance and it will be finalised soon. “One thing is certain. The CPI will contest from Begusarai,” he said.